FROM the tried and trusted stable of Viano organic fertilisers comes a new all-round plantfood that gives enthusiastic gardeners better-tasting and healthier vegetables and fruit. Already well-established across the Channel for more than 10 years, Viano Organic Plantfood has now arrived in the UK through sole distributor DJ Turfcare. This fertiliser has been specially developed to promote healthier and better-tasting fruit and vegetables. 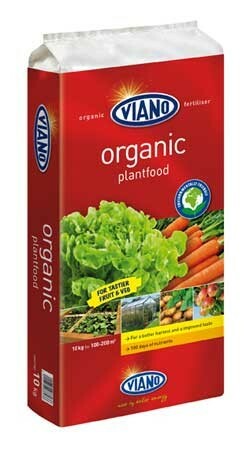 As a long-lasting fertiliser – three to four months – Viano Organic Plantfood produces a wide range of essential elements, with the added bonus of enhancing soil life, improving soil structure and increasing nutrient concentration in the soil. The easy-to-spread fertiliser crumbs can be incorporated prior to planting or sowing – or used to give fruit and vegetables a boost just when they need the extra nutrition. Viano Organic Plantfood is ideal for all leaf and root crops and can be applied to all fruit crops – including apples and pears. Harmless to pets, wildlife and children, this fertiliser is used at 100 grams per square metre before planting or sowing, and 50 grams during the maintenance period – with applications necessary only every eight to 10 weeks. It has the added environmental pedigree of being manufactured entirely using solar energy. Contains only prime materials according to Annex 1 of the EC-regulation 834/2007 and 889/2008. Authorised by TÜV Nord - the authorized Belgian Institution for Inspections in Organic Farming.